An immensely practical resource, Health Care Fraud and Abuse Compliance Manual provides a comprehensive overview of legislative and regulatory restrictions that affect the way health care providers conduct business and how they structure relationships among themselves. This treatise helps providers determine the boundaries of permissible conduct under the myriad statutes and regulations that relate to health care fraud and abuse at both the federal and state levels. This authoritative resource will make you aware of your crucial obligations and options. 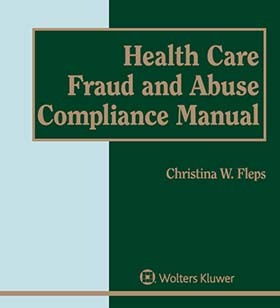 Each chapter of the Health Care Fraud and Abuse Compliance Manual describes what the law requires, how it applies in a health care context, and what the penalties are for failure to comply.